Review: Caroline’s Kitchen by Original Theatre Company (touring) at Derby Theatre – East Midlands Theatre. The saying goes that the kitchen is the heart of the home, but in the case of ‘Caroline’s Kitchen’, nothing could be further from the truth. Her celebrity chef career projects a bright smile and a sheen of glamour, but behind the scenes, her family unit is disintegrating around her. This modern-day setting becomes the arena in which, with the help of a bottle or two of wine, secrets unfold and truths are told. The play runs at Derby Theatre until Saturday 26th January. The premise is sound and one not unfamiliar to playwrights: there is an on-going fascination with how differently people live their lives behind closed doors. It’s an idea that has been examined in thrillers, comedies, psychological dramas et al. In a play which runs in one continuous scene, it’s quite a challenge to uncover the detail of people’s lives, without the benefit of steps in time through which to expose change. So, it’s an interesting decision by writer Torben Betts and it generally works, as we follow the descent from public façade to private disintegration, via the medium of alcohol. The chef Caroline, the ‘darling of middle England’ played by Caroline Langrishe, is self-absorbed, shouty and pretty unpleasant, ignoring the attempts of Leo, her son just graduated from Cambridge (with a First, you know! ), to actually have a proper conversation. As such, the character is quite unlikeable, and that’s a problem when you want an audience to engage with the story. She has an equally obnoxious husband, Mike, a dinosaur of a banker, whom Aden Gillett manages to portray with gusto and some great comic expression. Whilst background information is given about their families, which helps to explain some of their attitudes, it still seems a poor excuse for their boorish, charmless behaviour. James Sutton, as Graeme, and Elizabeth Boag as his wife Sally, give understated and touching performances of these much more ‘normal’, working people, with their real-life struggles. Caught up in the world of the privileged and celebrity, they are dazzled and entranced by it, but they soon realise it for the empty mirage it is. The set design is quite prosaic and rather at odds with the idea of the Mortimers as wealthy, upper middle-class people with lots of money. This kitchen will not be appearing on ‘Grand Designs’ anytime soon. The play is billed as a comedy but fails to deliver much real humour, resorting to rather obvious and out-dated references to vegetarians, homosexuals and ‘dusky maidens’. Whilst the writer may be writing these dated lines for Mike to establish the dinosaur attitudes the effect becomes tiresome and loses credibility in the husband character. Overall the play begins to feel rather like a 1970s farce, and yet not sufficiently knowing to be laughing at itself. This reviewer went from being someone looking forward to a dark modern comedy to someone sadly bemused rather than amused at the story. However, the almost capacity Derby Theatre audience seemed to enjoy this well-worn humour, the revolving-door type physical activity and the pacey script. 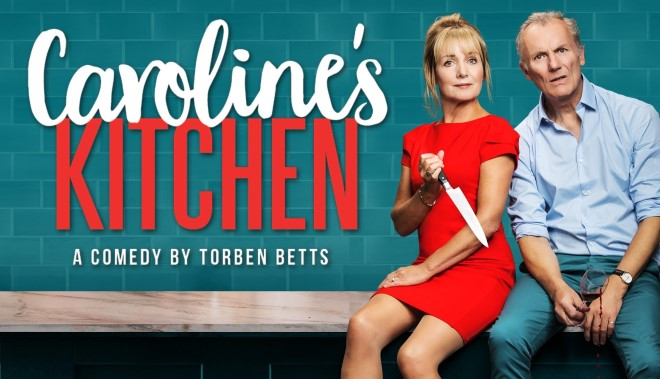 What this audience were expecting and what they got from Caroline’s Kitchen is down to the individual but it is a shame this Original Theatre Company production disappointed this reviewer. Totally agree with this review. I saw it on the Friday evening performance.